The Phantom P.I. 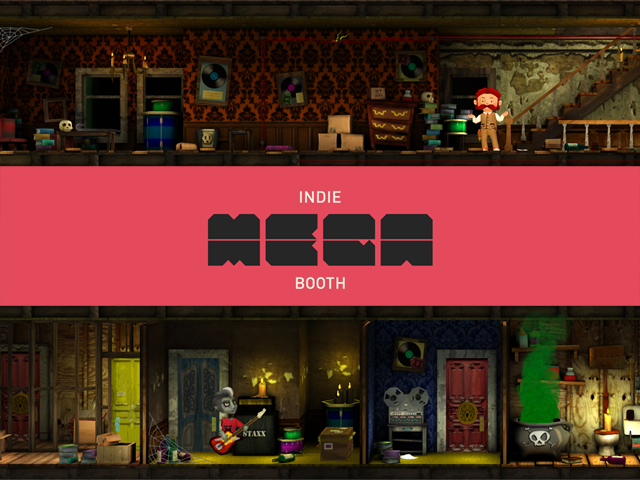 Mission Apparition is going to PAX East as part of the Indie MEGABOOTH! Plus we report on our experience showing the game at GDC Play 2014. We're thrilled to announce that The Phantom P.I. Mission Apparition will be playable at PAX East 2014 as part of the Indie MEGABOOTH! Cathy, Christine and Tim will be heading over to Boston to demo our game and we'll also be handing out some fun goodies. If you're going too, be sure to stop by the Rocket 5 booth to say hi and take The Phantom PI for a spin! Those of you who develop games know that there’s nothing quite as terrifying as putting your game into the hands of gamers and watching them play it for the first time. Months and sometimes years of hard work can either be validated by cheerful squeals of happy players or dashed to bits on the rocks of harsh criticism by those who don’t “get it”. Last week we took The Phantom PI Mission Apparition on the road to the 2014 Game Developers Conference in San Francisco and to our relief, the response was amazing! We estimate that about 500 people played the game over the course of the 3 day event - we had 3 stations setup and at least 2 were in use pretty much the whole time during the 3 day event. The response from gamers was overwhelming positive and nearly everyone who played took the time to tell us their thoughts on the experience. Most people felt that the controls were intuitive, that the puzzles where easy to understand yet challenging and that the game “looks beautiful” (blush)! We also got a good bit of criticism that will help us tune the game as we get closer to release – thankfully there were no real surprises, all of the critiques were totally things that we can fix and many were things that were already on our todo list. The GDC Play space was easily the most exciting and active area in the whole event, with a constant rumble of games and gamers hanging out, talking and playing with stuff they’d probably never heard of before. Compared to the South Hall which housed all of the big name companies in video games (plus the IGF nominated games) with their flashy booths and super-soft carpeting, the GDC Play space in the North Hall was noisy, casual and alive with excitement. We were surrounded by amazing developers from all around the world including a few of our friends like the awesome folks at Phantom Compass and the OMDC booth which allowed a bunch of other Ontario developers to show off their games. We also made a few new friends at Schell Games, Shark Punch, Right Pedal Studios and Xibalba Studios. Next stop for The Phantom PI is PAX East and the Indie MEGABOOTH! If you're going, be sure to look for us under the huge MEGABOOTH banner! See you in Boston!